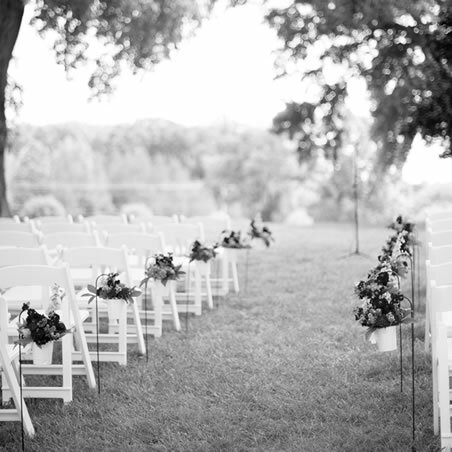 We at Flora Corner Farm would love to help you realize your dreams for a unique wedding and/or wedding reception. Our tranquil farm setting nestled between fields of crops is the perfect venue to make your day special. As you and your guests are welcomed to our farm, they may wander around the extensive lawn and flower gardens. They may enjoy playing lawn games or sit under an umbrella and enjoy drinks. We will pamper you and your guests with our network of vendors to cater to your every need. We are also happy to include and/or create any custom items requested for your special event. Sample items we have created in the past include but are not limited to: table settings using quilt overlays and mis-matched dessert plates and teacups, a wall of mirrors, gift baskets, candy jars for a candy/favor table, ceremony cones, and cake, pie, or cupcake pedestals. We feel it is a privilege to be a part of your special day and we also offer the following services: indoor barn seating, outdoor seating, catering services, various ceremony locations, a tented site for larger groups, dressing rooms for the bridal party, and a wedding coordinator to help with all your needs.